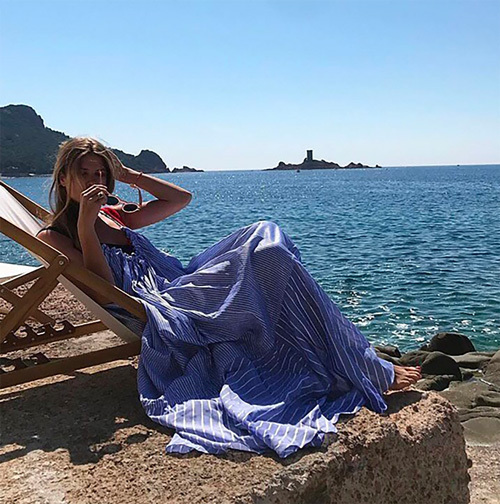 Found: dreamy dresses that slip from the bedroom to the beach! Thanks to some stylish holidaying Brits, I discovered Three Graces London, an up-and-coming line of nightwear-turned-daywear dresses. Signatures include relaxed, nearly sheer silhouettes rendered in the finest, whisper-light cotton, linen and silk. New Yorker Leandra Cohen, below, proves that these dresses can even pound the city pavement. I'm swooning for this cotton mouselline lovely (on sale, last picture), this striped Victorian-inspired dress, this cotton voile maxi, and this billowy halterneck (second snap below). A trend that allows you to walk around outside in your night gown during the daytime, what is it not to like?? Comfort over fashion (almost always...)! love it. Love the white dress look!